This all started innocently enough; I was in the market for a coffee canister. Something simple - not too big, not too small and at least a little cute. Within the ranks of Amazon's thousands of offerings I was sure to find something to suit my tastes, right? Wrong. Blame it on my pickiness (it's fine, she and I are well acquainted), but I couldn't find the simple-canister-with-an-attached-scoop of my dreams. Woe is me, in lieu of flowers send canisters, etc. I was able to find a simple white canister (now with scoop!) at Michael's and grabbed that thing for less than eight bucks with a coupon. She was so plain, so empty, so…ready for my magic hands. She was getting a makeover! 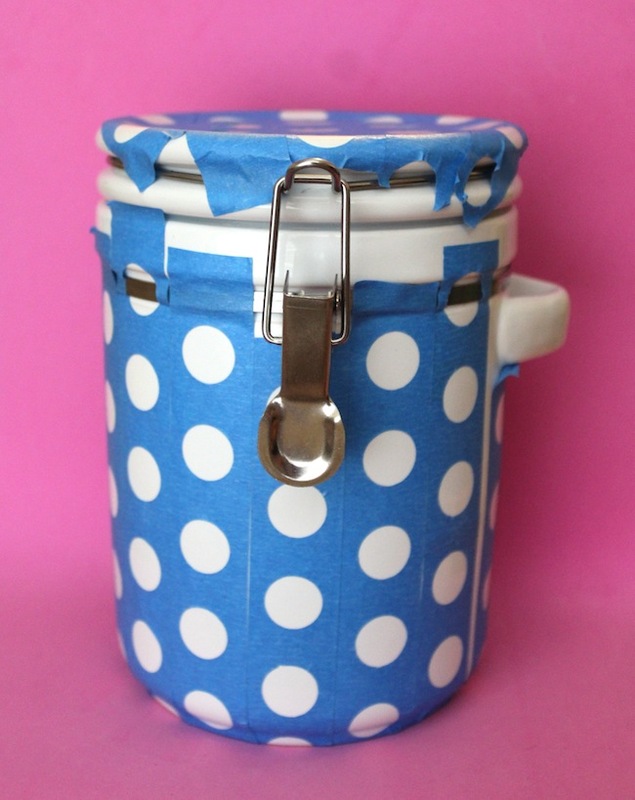 First, I pondered - how do I get perfect polka dots? Maybe not perfect perfect, but mostly perfect. Hey, I'm laid back! Though, perfect perfect is great too. Maybe then let's just go for perfect perfect. Flexible! See how laid back I am??? My plan: I'll draw on perfectly symmetrical lines with a ruler so everything is lined up just right. Oh, that's very difficult on a rounded surface? Let's use a level then. Oh, that's basically the same thing? JK, we're doing this with a length of string and a grease pencil and…the plans went on and on. That's good for placement, but what about the actual dots? I could buy a rubber stamper! Eh, those look flimsy and cost way more than they should. I can make a stamper! From what, you lunatic? Okay, I'll use the lid to a product and stamp a circular outline and then fill it in! GENIUS AWARD RIGHT HERE PLZ. Oh, right, that's super messy and, again, that damn rounded surface. 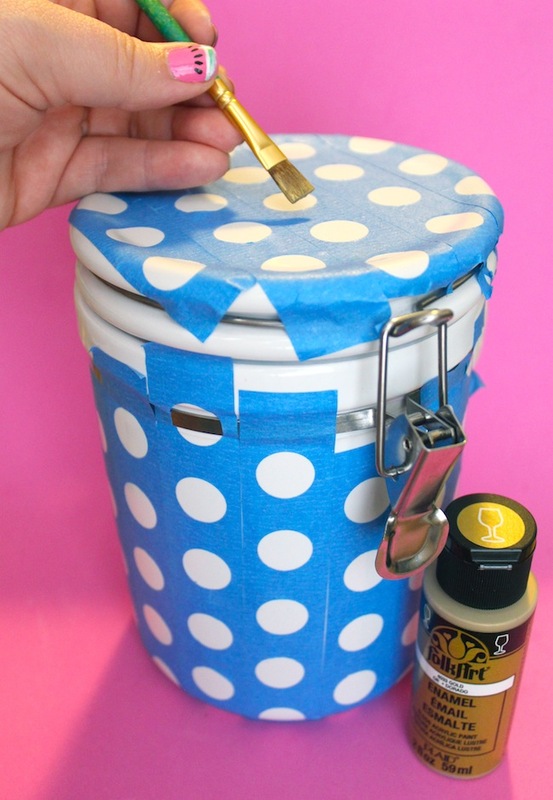 How about I just put circle stickers on the canister and paint everything around them gold and go for a reverse effect? That'll show them! Okay, first - show who? Second - that's not even easier. You're losing it, kid. Then, when I least expected it, actual genius struck! I'm gonna make stencils out of painters tape with a giant hole punch! I nearly wept at my own brilliance. Giant hole punches (or really, small paper punches) are like $5 B.C. (Before Coupon) at Michael's. I had painters tape already. This was gonna happen. I simply inserted the tape in the punch and made a perfect circular hole. No prob! In an attempt to repeat this, I realized this was not really a 'no prob' scenario. Tape is sticky! It stuck on the punch and was hard to pull out. Knowing I had to make a lot of those things, I needed a better way. Duh, I'll stick the tape to paper first and then punch because peeling off painters tape is easy! That's literally what it's designed to do. Except it was only mostly easy. Some spots got paper stuck to them, negating their purpose as a stencil. Okay, I'l switch to card stock since it's thicker and probably won't stick as easily. Yay! This is mostly true! It still sticks here and there, but guess what? This is getting old fast! I punch a bunch of strips full of evenly spaced holes and peel them off the card stock. Success? Now we pop those stencils on and we're basically done, right? HA. This project laughs in your face. First, wipe the whole canister down with rubbing alcohol. 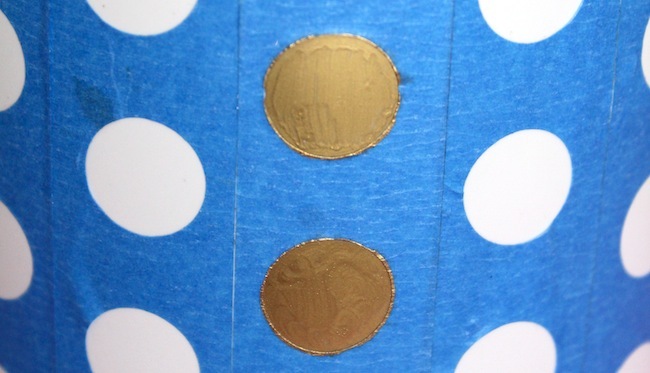 To apply the strips of stencils, either rely on a keen eye like I did or bring out a ruler to check as you go. It helps to find the center of the top and mark it with a pencil (which will wipe off) before laying down your first strip. Hot Tip: to apply on the top of the canister, start in the center and work out. On the body, start on the side and work around so that any wonky measurements will end up in the back where no one will dare to look. I innocently painted on a layer of the enamel paint. I thought it seemed thinner than I expected, but I was still riding high. I painted the whole top of the canister and waited excitedly. This paint is made for ceramic and other surfaces and meant to be baked on or air cured afterward. I didn't quite get that far, though. WHY THO? Do I not deserve a coffee canister? The paint stuck to the painters tape (one job, buddy!) instead of the canister and peeled off almost everywhere. It was very sheer too, and would've taken at least three coats to be opaque. I'm in too deep to turn back now, yet I have nothing to show for it but a bunch of hole-filled tape. Perhaps I should take this tape and cover my eyes for all of eternity so that I may pretend my canister is completed and beautiful. I'm sure I'd still see outta these stupid holes though. Hmmm. WAIT. DON'T PAINT MARKERS EXIST? *googles paint markers* THEY DO! It's glowing, right? It's not just me and my heart eyes? Oh, it is? This Sharpie paint marker in metallic gold is also good on glass, ceramic and other tricky surfaces, except this paint is opaque and it stays put! It's…beautiful. d) not going to stick to painters tape, which goes against the ONE purpose of both the tape and the paint, not that I'm still bitter, but you get it. Bonus - I only needed one pen and still have some use left in it, and it dried almost immediately. I left it overnight just to be safe. Fool me once, shame on you; fool me twice, I'm smashing this canister in the street. You can see some marker strokes, but when it dries the color smooths out nicely. When it's dry, just slowly take those paint strips off. Treat it like emotional therapy for what this project has done to you. Okay, so let me say - I'm happy with my canister and will use it daily. Let me also say - some of my perfect perfect polka dots are…not so perfect. I'm totally cool with this because, c'mon, look at this journey - I'm just excited to end it. But more than that, the slightly fuzzy dots have grown on me tremendously and I can't believe I didn't do this on purpose. Now, perfect perfect seems so boring boring. I think the cheap ceramic is to blame for this result because the stencils were tightly stuck and I was careful with my marker. It just seemed to bleed like a cheap lipstick bleeds outside the lip line. When I showed my sister these fuzzy-edged dots she said she loved them as is, and that they looked cool, like gold bullet holes. So she's either a wonderful liar or a wonderful sister, but let's be optimistic. She pointed out that since the placement was so precise and purposeful (I believe there was a Martha Stewart comparison, but who can remember these things?) (I can. There was. ), the messiness of the dots looks intentional. A mix of chaos and order. Just like this whole project, really. Sure, I could re-outline all the dots with the marker or another paint color. Honestly, though? I'm just going to embrace the imperfection. I actually prefer it! Plus, I got the hint that maybe I need to be a little more of a "go with the flow" type of girl and less "hmm, how can I completely control the flow?" Point taken, canister. Point taken. 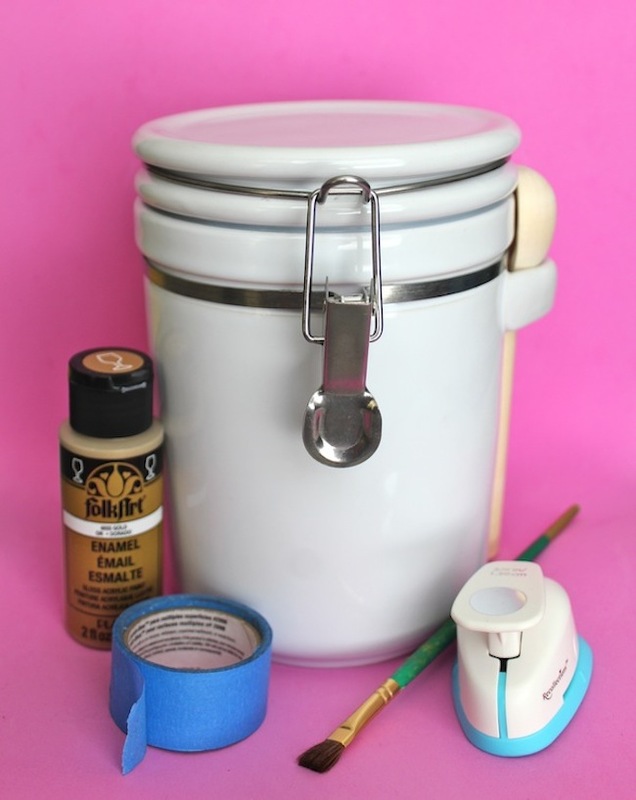 Have you ever painted a canister? Have any tips on working with enamel paint? Have you made it safely through this harrowing journey? What a great DIY project!! 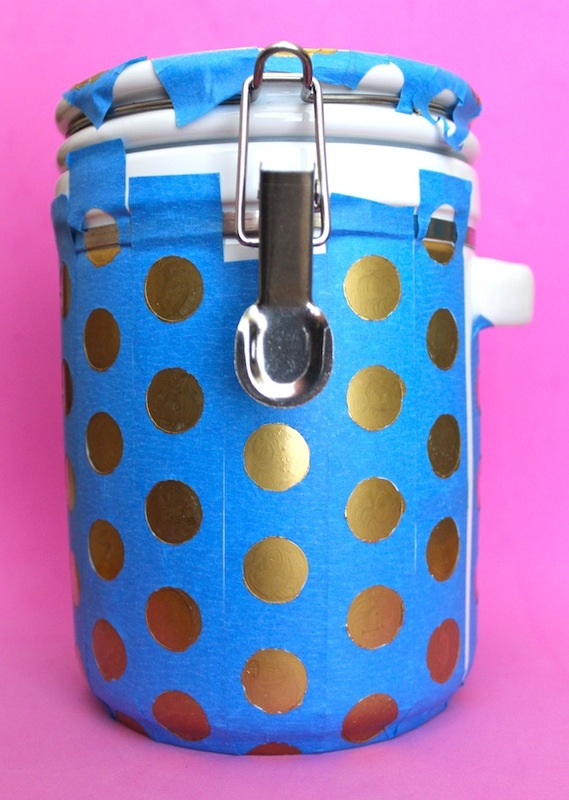 I actually kind of like the imperfect dots - it adds character to the canister!